Has that ever happened to you? Have you ever listened to the gospel reading and then said to yourself, “What is he talking about?” Have you ever read a piece of scripture and wondered, “What does this mean? And how does it apply to my life?” I have and I still do. Almost every week that’s my starting place with the upcoming Sunday gospel. This week was no different. Sheep and shepherd, gate and gatekeeper, thief and bandit, voices, abundant life. What’s all that mean? How does it apply to our lives? I can’t put it all together in a neat package that makes sense. There’s too many contradictions and mixed metaphors. At the beginning of today’s gospel (John 10:1-10) it sounds like Jesus is suggesting that he is the shepherd who enters the gate, unlike the thieves and bandits who hop the fence. The sheep, he says, listen to and follow the voice of the shepherd but run from the voice of strangers. But then later in today’s gospel Jesus says that he is the gate. So he is the shepherd who enters the gate and he is also the gate the shepherd enters? And then he says that we can enter him as a gate to abundant life? It reminds me of when our younger son was little. He knew the sayings, “How about them apples?” and “Try that on for size.” But that’s not what he would say. He would say, “Try them apples on for size.” I told him that doesn’t make sense. It’s either one or the other but not both at the same time. I want to tell Jesus the same thing. I imagine, though, that he would respond pretty much like my son would. He would just laugh and then say again, “Try them apples on for size.” That’s what I want us to do today with this gospel. I want us to “try them apples on for size.” I really believe that is what Jesus is asking us to do. I say that because St. John, today’s gospel writer, clearly states that Jesus was using a “figure of speech.” That’s why this text, like so many of Jesus’ sayings and teachings, is difficult to understand, and that’s also the key to dealing with this text. This text cannot be taken literally. It makes no sense. The rational, logical, intellectual mind cannot understand a figure of speech. The figure of speech points beyond itself, in this case to abundant life. A figure of speech asks us to think, see, and listen differently. So let’s take today’s gospel and play with the images, dance with the ideas, ponder and muse over this figure of speech, and see what it brings up in us and where it takes us. Let’s start with abundant life. That, Jesus says, is why he came; that we might “have life, and have it abundantly.” What does that mean for you? Where is your life abundant? And in what ways is it less than abundant? Keep in mind, however, that abundance is not something we get. It’s a way of living and being. The abundant life is not about quantity, wealth, success, approval, popularity, security, being number one, or any of the other things we often think it is. How many times have you gotten what you wanted, been what others said you should be, or done what was encouraged and rewarded by society only to discover your own emptiness and poverty? You had it all but you were not abundant. No, the abundant life is touching and living the divine life. It’s a quality not a quantity. It’s about meaning, integrity, purpose, creativity, relationship, and wholeness. The abundant life adds to the life of others and the world. It’s life that leads to life, love that leads to love, joy that leads to joy, hope that leads to hope, kindness that leads to kindness, generosity that leads to generosity, beauty that leads to beauty, and gratitude that leads to gratitude. It does not add to the pain of the world but adds to and enhances life, our own as well as others’. Isn’t that what we really want? Isn’t that what we want for ourselves and for each other? I do? Don’t you? I want us to follow the shepherd into the pasture of abundance. Who is the shepherd? The obvious answer is Jesus. That’s certainly not a wrong answer. Later in John’s account of the gospel Jesus will say, “I am the good shepherd” (John 10:11). But is that the only answer? Could there be other shepherds? And if so, who might that be? What about Psalm 23 that we read a few minutes ago? That said that the Lord, God, is our shepherd. He revives, he leads, he protects, he feeds, he waters, he pastures. What about you and me? Could we do those things? Could we be the shepherd? Who are the people that have shepherded, guided, nurtured, and protected your life? When have you shepherded the life of another? Maybe the shepherd here is anyone or anything that nourishes, fosters, empowers, and guards life. It could be God, Jesus, you, or me. Shepherding is not only an action but also a relationship. Ultimately, though it seems to be God’s way of being in the world, in the life of Jesus, and in your life and my life. What about those thieves and bandits? Jesus is not warning us about having our things stolen but about having our life stolen and our abundance depleted. Thieves are stealthy. We often don’t know they’ve been here until later. They come in the night when we are asleep and unaware. Then one day we wake up and wonder what happened to our life. How did we get to this point? Our life is a mess and we don’t know when or how it happened. Where did our life go? Maybe time caught up with us, maybe we took a relationship for granted, maybe we procrastinated, maybe we were too comfortable, maybe we became complacent, maybe we were too busy or preoccupied, maybe we weren’t paying attention, maybe we just gave up, maybe we opened our heart to the wrong person or thing. Thieves are sneaky and they often wear the disguise of acceptance: work, money, productivity, knowledge, a relationship, meeting other’s needs and expectations, saying yes and being available, striving for quality in what we do. There’s nothing wrong with any of those things until they begin to thief our life. And sometimes they do. Bandits, on the other hand, are overpowering. They come in the daylight. They don’t even try to hide. We know when they are here and when we are being robbed. It’s those times when we know our life is less than we want it to be, we recognize the patterns and behaviors that are destructive, we know there is a better and different choice to be made, but we continue down the same path. It’s falling down and refusing to get back up. It’s recognizing our brokenness and refusing to ask for help. It’s choosing our resentments and anger over forgiveness. It’s feeling the pain but refusing the treatment. It’s knowing what will give life but giving in to fear. In what ways has your life been stolen? Who or what are the thieves and bandits in your life? What will you do now? What have you learned? How will you guard your heart against the thieves and bandits of an abundant life? The abundant life is always a matter of the heart. We are the gatekeepers of our lives. We are the keeper and guardian of our heart. Guarding our heart means staying awake, being watchful, and remaining diligent. Awareness of and reflection on what is happening within and outside us are the gatekeeper’s key. Depending on who or what it is we either open our heart or keep it closed. Sometimes we need to open the gate and sometimes we need to keep the gate of our life closed. Look back on your life and you can see that. To whom or what have you opened your heart in the past? Where did it take you? Did it lead to the pastures of abundance or was it a dead end, or maybe a detour? When have you opened your heart and been surprised by possibilities and a fullness of life you could never have imagined? 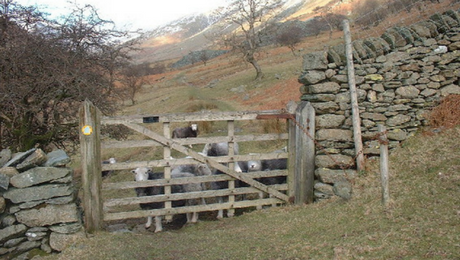 Who or what stands at your gates today? Who or what are the people, opportunities, possibilities, and choices that seek entry into your life? The gates in our life are threshold places, times of discernment, moments of transition, and decisions to be made. To whom or what do you need to open and to whom or what do you need to close? How might your life change if you open? What might you miss if you close? Will your life be enhanced and empowered by opening or will something be lost? What pain or wound might you prevent by closing? Where is fear in all this? Which will enhance and add to life today, opening or closing? To what voices are we listening? The voices to which we listen form and shape our lives throughout our lifetime. And there are a myriad of voices in our world. What voices are rattling around in you? Vying for your attention? For better or for worse we eventually begin to speak with the voice that has formed and shaped our lives. Who do you sound like when you speak? It could be your mom or dad, your spouse, your boss, your fear or anger, your wounds, the church, politicians, television, the internet, friends, money, success, popularity, expectations, failures, self-criticism or self-hatred. Is it the voice of thieves and bandits? Or is it the voice of wisdom, life, love, compassion, beauty, generosity, hope, joy? The voice of Jesus? The voice of a shepherd? Which voices are loudest in your life today? What voices have you invested in? Are they worthy of your trust and your life or are they bankrupt? Are they bankrupting you? To which voices do you need to close the gate of your heart and to which ones do you need to open? In a few moments we will baptize Lane and James. When they come to the font they will stand at the gate and we will make vows on their behalf. Some vows will be about opening, and some about closing. Then we will vow to open our hearts to them, to support them, and to be their shepherds. What voices do you want them to listen to? How will you help them learn to recognize the shepherd’s voice? To what would you tell them to open their hearts and to what would your tell them to close? And what if you followed your own advice? How might your life be different? Abundant? More whole and full? Thank you Fr. Julius. I pray you and your congregation an abundant life. Superior set of questions for GOOD SHEPHERD Sunday. Excellent reflections. Thank you Michael. Thank you. May God bless you with peace and abundance. Love how the “confusion” in a child’s mind leads us to greater questions. I learn so much reading your posts! PS My kids all got mixed up with doing something themselves. Each one said, “I did it my own very self!” with great pride. A wonderful memory on Mother’s Day. Your post reminded me of those little lines. Thank you Jeri. “I did it my own very self.” I can hear the joy and excitement in that and I remembering seeing it in our boys. Yes, good memories. I hope you had a blessed and happy Mother’s Day.